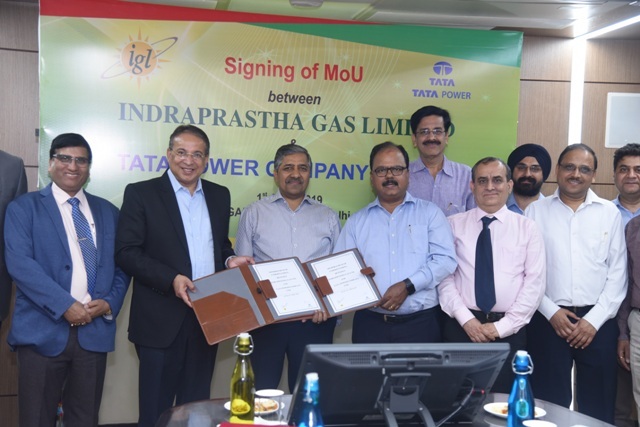 Tata Power and Indraprastha Gas (IGL) have announced the signing of a Memorandum of Understanding (MoU) towards setting up integrated customer services and value optimization. The MoU will also cover common safeguard activities of underground assets (pipes and cables) including Right of way for activities like maintenance and laying of pipes & cables simultaneously, routine patrolling of under & above ground assets. Both the entities will also explore possibilities of co-operation in electricity generation, Optical Fibre Network and Integrated Utility Services for water, electricity and gas. Speaking at the signing in ceremony, B C Tripathi. Chairman & Managing Director, GAIL said, “This initiative shall bring together synergies among two leading utility players and can go a long a way in improving operational efficiencies as well as customer experience. The two companies should also explore the possibilities of generating electricity from bio-gas using fuel cell technology”. E S Ranganathan, Managing Director, IGL said, “This MoU with Tata Power can be a big step forward in moving towards the concept of ‘One City One Bill’ on the lines of many developed nations and shall open doors for IGL’s diversification into solar power”.